The objective of this study is to provide information to those interested in the wellbeing of American congregations about how congregations are coping with and confronting not only recent economic events, but also the gradual, long-term changes taking place in the landscape of U.S. religious life. The first two studies in this series will set the foundation for a longitudinal framework in studying U.S. congregational life in future years. This study includes responses from 3,103 U.S. congregations, of which nearly two-thirds are Mainline Protestant, a quarter are Evangelical Protestant, and the rest are other Christian denominations (such as Historically Black or Catholic), Jewish, or "other" (such as unaffiliated congregations). Congregations were asked a series of questions about their finances following the Great Recession, which officially ended in the summer of 2009, as well as questions about their most current finances, including 2011 and 2012. This study also incorporated questions about congregations' use of electronic giving tools to shed better light on how these forms of payment might be influencing congregational finances. This study informs not only overall financial trends of surveyed congregations, but also how specific types of congregations talked about money and fared financially during the recession and its aftermath. 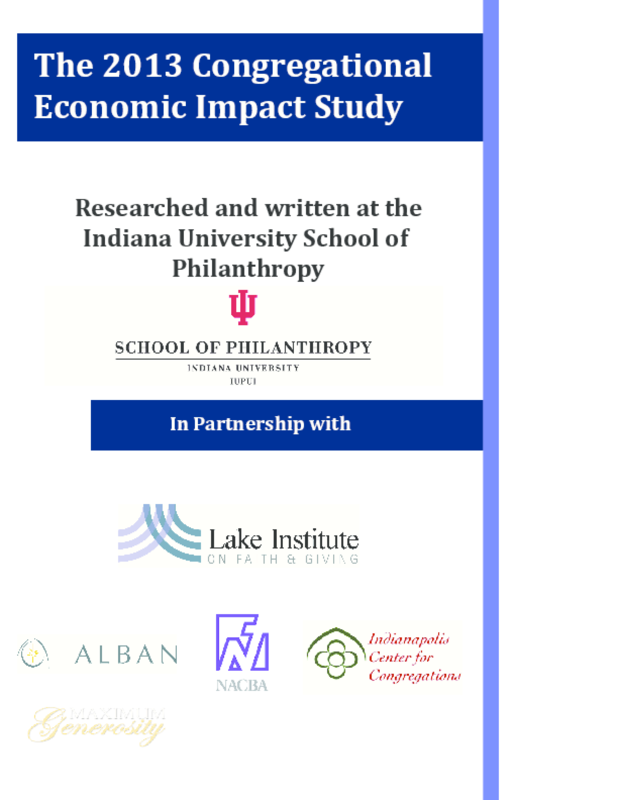 2013 Lake Institute on Faith and Giving at the Indiana University School of Philanthropy. All rights reserved.